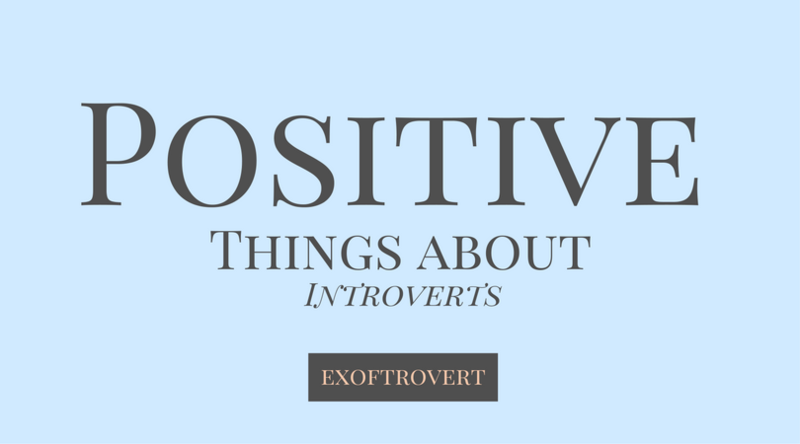 Positive Things about Introverts - The world has always loved extroverts, and an introvert is often viewed as a mismatch. Is that true? Or is there any advantage being an introvert? Let's find out. There are some people out there who are always considered weird, who can not be read, understand, and hard to guess, often make others uncomfortable, and they are introverts. While the extroverts out there, seemingly so comfortable with a group of people, planning to go where the weekend is going, introverts might just sit on the edge of somewhere alone, searching for the truth of the way of life, or with a smile polite on his face watching people passing by. It is common for introverts to accept the stamp of being arrogant, to have social anxiety or social phobia. But that's not true. Introverts are just more focused on their own inner world, unlike extroverts that are naturally oriented to the outside world. Introverts do not hate people, and they certainly do not need to be saved from their world, because there seems to be a popular misunderstanding. Which of course arises because extroverts are often considered better than introverts, and the world seems to accept this fact more. Here are some positive side and introverted person characteristics. Introverts take care of themselves, may not necessarily speak unless spoken to, and will avoid conflict as a rule of thumb. They are not aggressive and insolent, and they certainly do not insult people. All things, they are very nice to be around with anyone though still prefer not to say much. Introvert thinks a lot. And thinking so much allows them to understand and analyze things, not just at a superficial level, but at a deeper level, and as a result, they develop fully take on unique lessons. They, therefore, make good problem solvers and are assets in the workplace. In fact, they often prove to be very creative individuals because it's a very capable nature of thinking beyond the nuances of the obvious. People may assume that they are not the best friends to play with, but that opinion soon disappears once someone interacts with them. It's just that they need to know someone to feel comfortable around them. Once done, they may just be happy to surprise you with the kind of thing they never hesitate to share. Extroverts might like all the noise, but an introvert might have a very unique story to tell ... he should want to tell them, that's all. Extroverts are difficult to be alone, and always want to be accompanied by people for the same reason. The introvert is quite comfortable left alone with his mind and who may, on the other hand, seek silence from time to time. That does not mean that they prefer to be alone at 'all the time', they could just as well go to parties and do all that festive, but after they finish they may just want to go home and relax instead of going hanging out with the others. Introvert has some close friends and prefers to set this up to collect contacts. They take time to get to know people, and make certain friends only after really knowing them well. In turn, they can still be very good friends as well. Introverts do not always react violently and promptly in handling situations. They take time to understand events, think, and understand everything before saying anything. That's why they tend to suffer social oddities. In a world where everyone wants to be heard, an introvert prefers to listen, which is a virtue. Introverts love to observe people and learn about their nature, and when someone speaks to an introvert, they get the satisfaction that has been heard, because an introvert is able to convey from what he has learned. Introverts do not judge, comment, or advise on what a person does not need to and should not do in his own life. They provide support without judgment. Introvert is very low and simple. They, therefore, pose no threat to anyone. They are not always anywhere, wanting one form of activity or another, they are not demanding something done in their way, nor angry if it is not done, and they certainly do not take over and take responsibility, or force others to follow. They do not dominate, and they do not like other people to dominate their own lives in all things, they are very easy to be around with anyone. Introverts prefer casual, lifestyle that is not full of activity and constant in terms of targeting something. They prefer to keep their own business, and the perfect roommate or neighbor. Introverts do not open too often, they can not be read easily, nobody knows what they think, and sometimes, people may find them smiling for themselves i-all this just adds to the mystery of their lives. They are not like open books, so if someone really takes the time to get to know them, they will surely be surprised to see many interesting and unique sides of their personality. Many introverts find it difficult to be themselves in a variety of situations, as most people find it easier and more comfortable to be around extroverts. They find it easier to do than have to explain their more complicated side of the world. Once we know, because so many positive sides of being an introvert, why do not people take the time to try to get to know them, what are they and for who are they?